Spend too much money on gym fee? 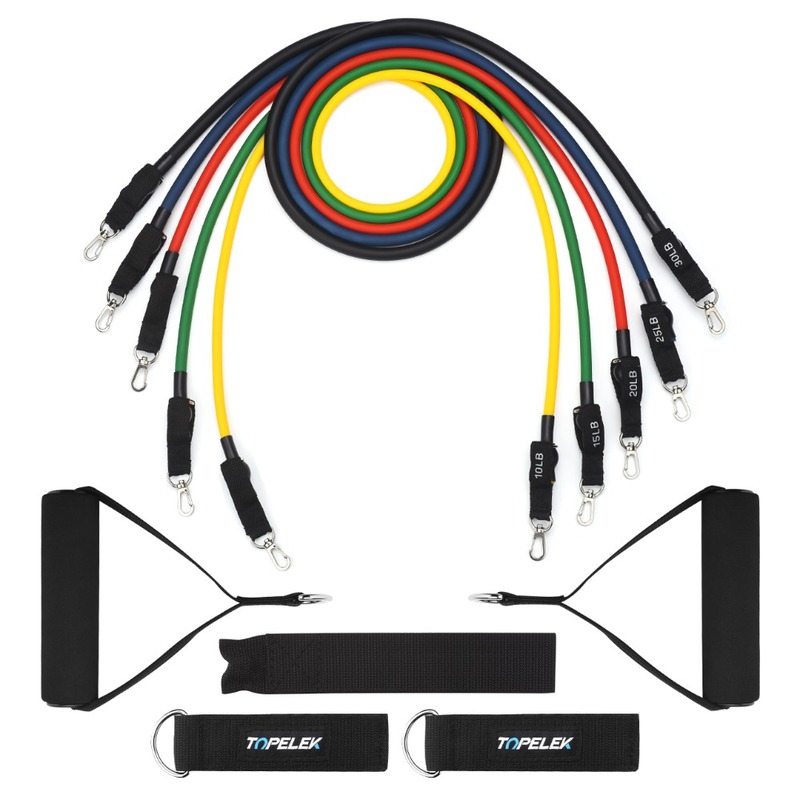 Take this resistance band kit back home and turn your home or other places to a personal gym! Train your muscle wherever you like in your spare time. There are 3 major muscle groups for the upper body: chest, back, and shoulders. 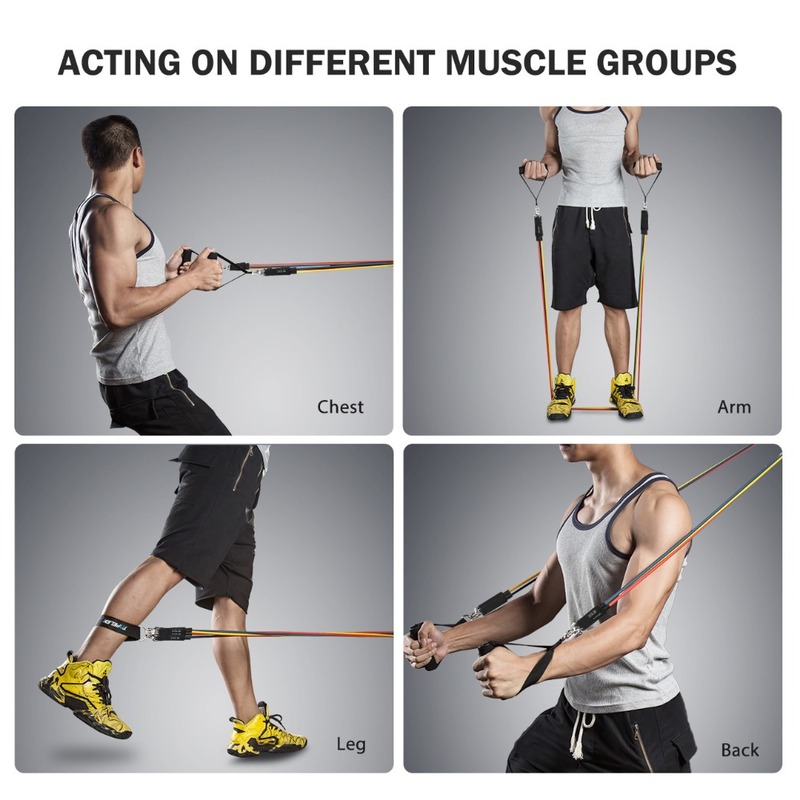 With resistance bands, you can do basic exercises that can effectively exercise these 3 areas as well as your arms. The user manual contains instruction for training different parts of your body. 1. 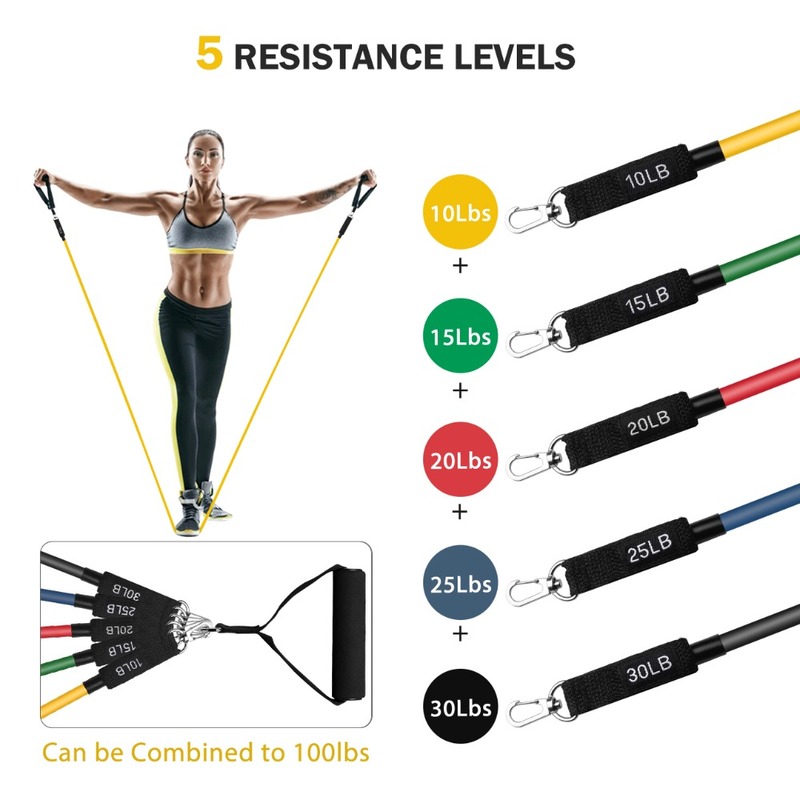 5 levels Resistance Bands: Different color bands provide you with different resistance when using: Black(30lbs), Blue(25lbs), Red(20lbs), Green(15lbs), Yellow(10lbs). You can easily hook up two or more bands to the handles to create more resistance as you get stronger. 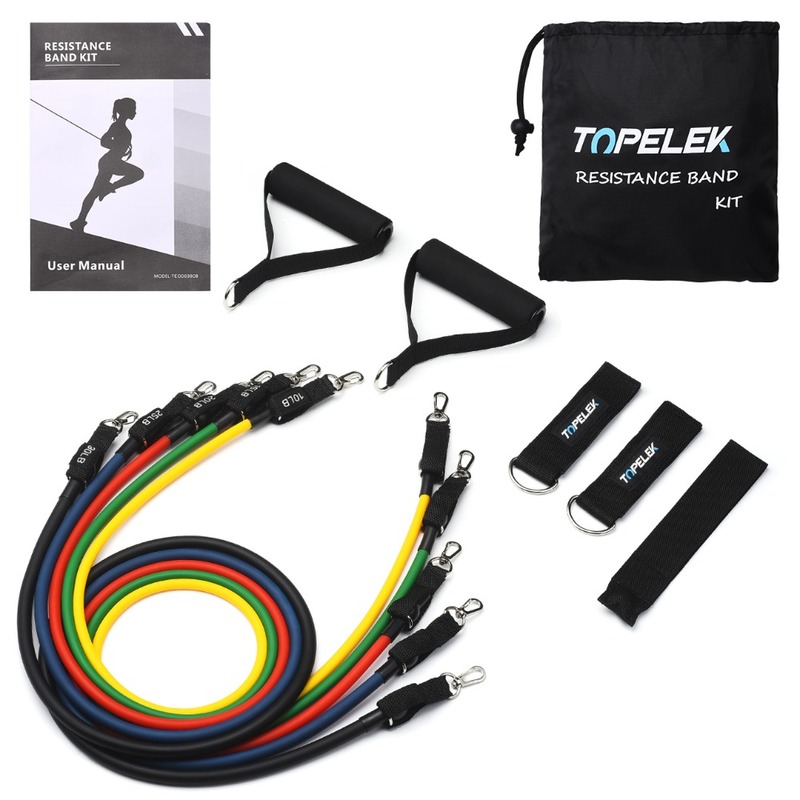 These resistance bands will assist you in building muscle, losing weight, and rehabilitating from sports injuries. 2. Soft Comfortable Foam Handles: This exercise bands kit comes with two soft cushioned foam handles for comfort during exercise. 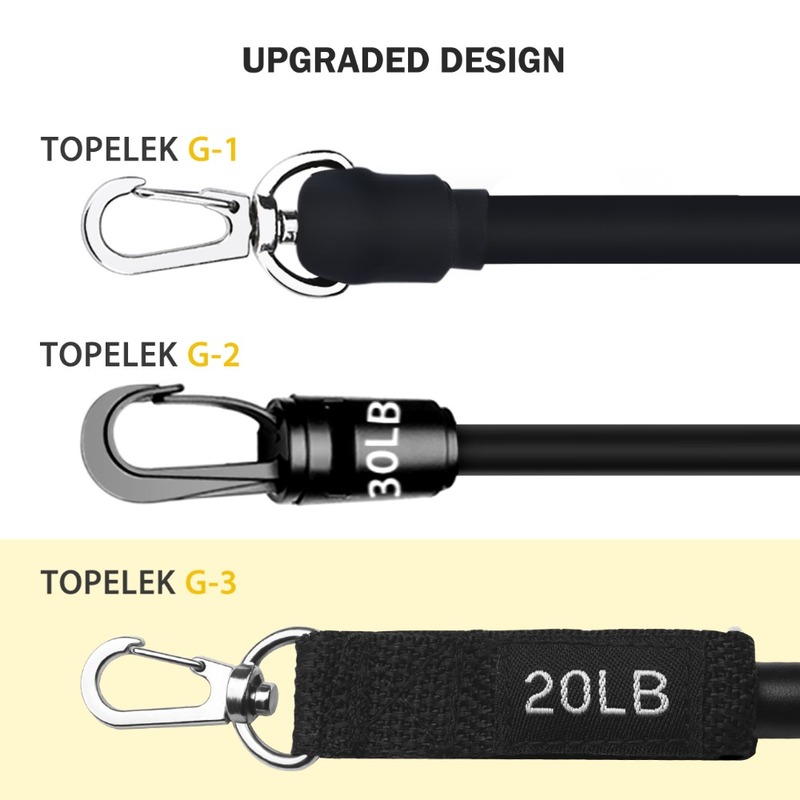 They can be easily attached to bands with metal carabiner rings. The soft foam handles will protect your hands from injuries and absorb sweat to prevent slipping. 3. 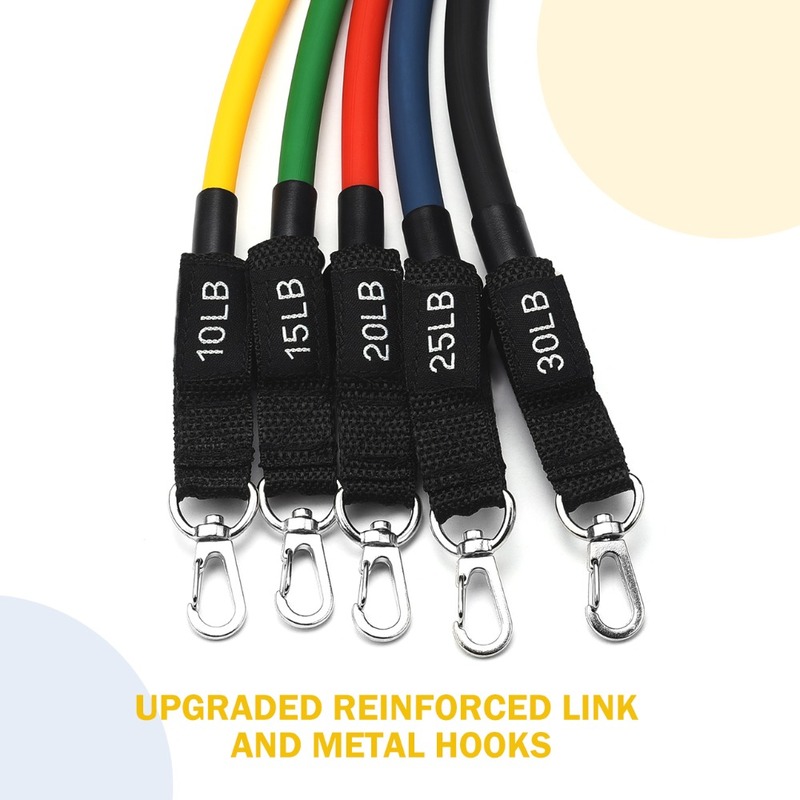 Reinforced Link & Excellent Quality: With an upgraded design, the metal hooks are sturdy and will not distort or snap even under strong tension. 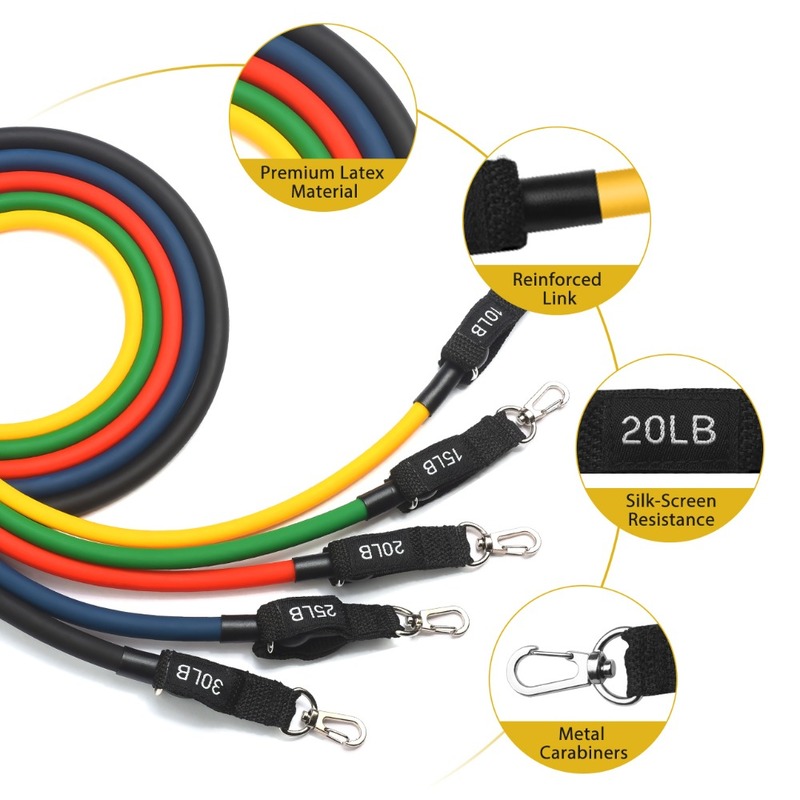 The carabiner rings are easy to detach from resistance bands and convenient to replace. The bands are made of premium rubber latex. 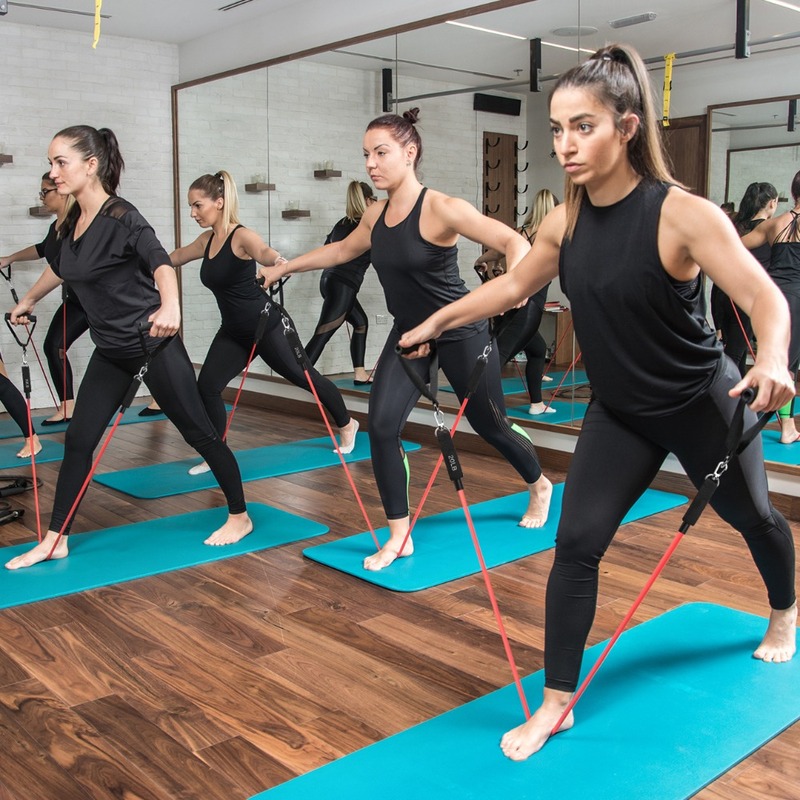 All details of our resistance band kit are more durable than the previous generation which remove your worry about the quality. 4. 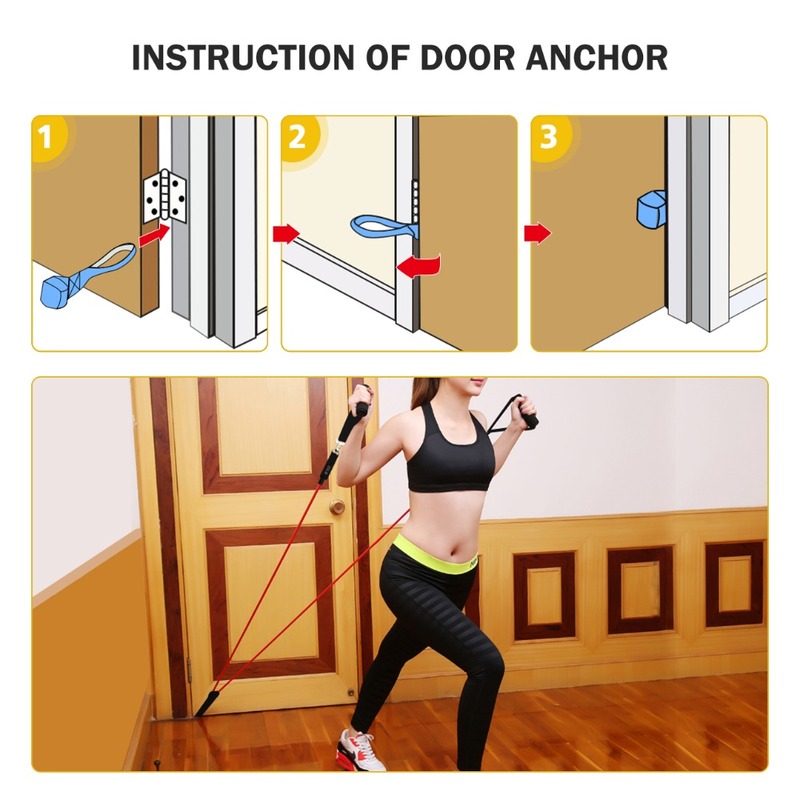 Door Anchor & Ankle Straps: The door anchor attachment will be helpful for you to do workout at home, in a hotel room or any place with a door. Simply slip it through the crack and it will be held by a bead that is sewn into the nylon strap, which provide enough resistance against you. The anchor attachment and ankle straps add workout varieties to your exercise plan. 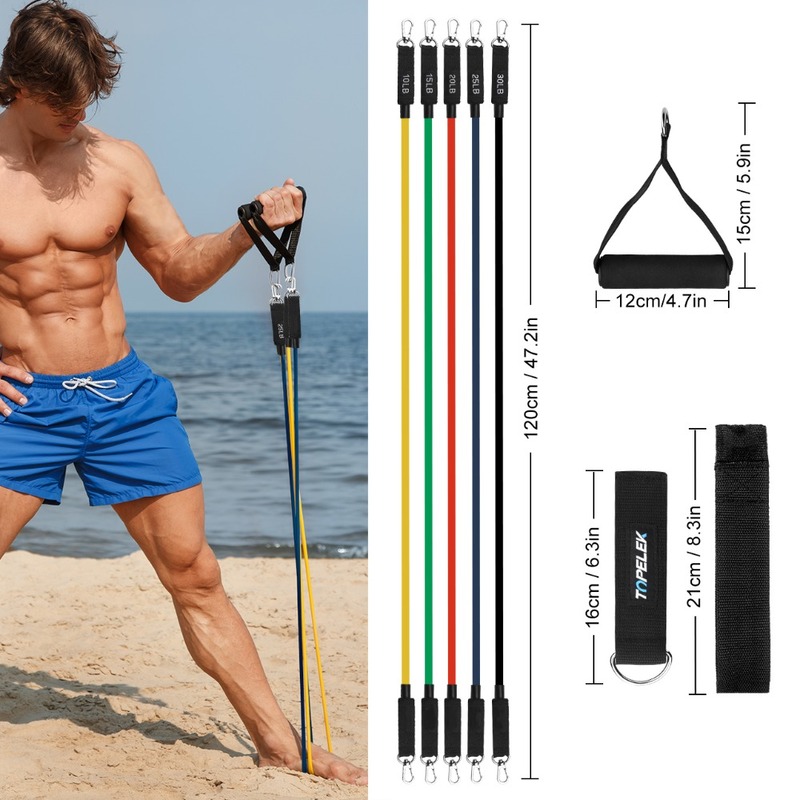 These 2 accessories will help you do more fitness movement as row, lunge, etc. 5. 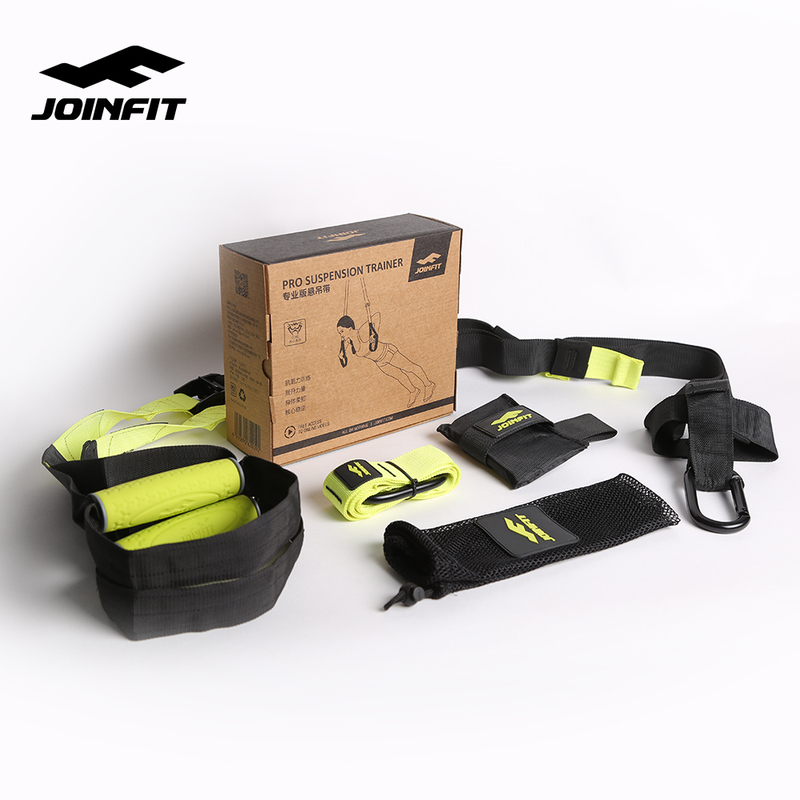 Convenient & Portable: Store all the bands and accessories into the carrying bag every time when you finish your training, which is convenient for storage. The light-weight bag allows you to take it anywhere with the whole kit, which is portable for travelling.